The bottle is full - see photo for actual fill line. Launched in 1970, it is classified as a floral fragrance for women. 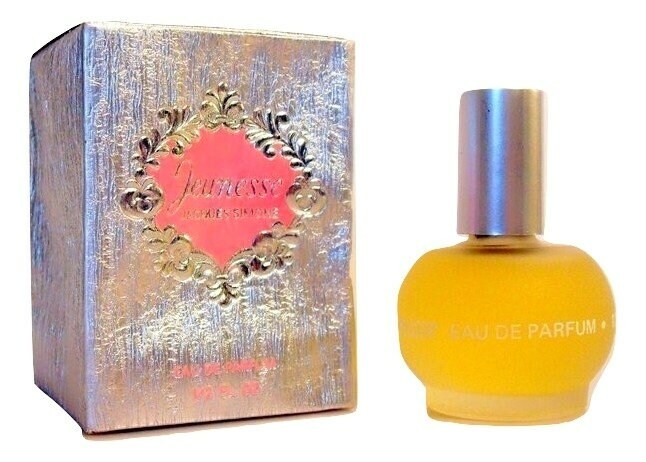 It smells like a cross between Joy by Jean Patou and L'Air du Temps by Nina Ricci. "Jeunesse" by Jacques Simone is packaged in a box made of "ripple board," product of House of Harley, New York, printers and packagers. Firm claims the material will not break or crack, and can be printed, gold-stamped or embossed. The woman of elegance is never without Jeunesse by Jacques Simone. The perfume that is rare, mysterious and full of intrigue yet subtle, fresh young and romantic." Jeunesse has been discontinued since the late 1970s. It was still being sold in 1975. The fragrances I sell are are old and vintage, they are most likely not fresh as they once were and their scent most likely has changed over time, because of this, that I cannot guarantee that the fragrance still smells good to you. Please see my policies on vintage fragrances as I cannot offer refunds or accept returns on this item. Ask any questions before purchasing.